The Society houses more than 25,000 maps and atlases in its Archives. The majority focus on Wisconsin, the Midwest, the United States and Canada. About 80 percent of the collection predates 1900. If you have questions about historical research, please contact our Library Reference Services staff by phone at 608-264-6535 or by email. This 1908 view of Madison emphasizes the two most important facets of the city--the University and state government. Although the Capitol building is shown as complete, it was not finished until 1917. The large round structure at the lower left is the Lakeside Assembly, where Madison Chautauqua meeting were held. This 1836 map of Milwaukee, drawn by Increase Lapham, presents the city as far more developed than it actually was. This basic reference map of the state shows natural features, railroads, county seats, and political boundaries against the G.L.O. township and range grid. It includes an inset map of the Milwaukee area. This is the oldest map in the Parker collection. It is based on the geography of Ortelius, who is considered to be the creator of the first modern atlas and the first to propose a theory of continental drift. This map was published in Hennepin's "A New Discovery of a Vast Country in America". The author is known to have exaggerated and sometimes lied about the extent of his travels in North America. However his maps, including this one, were used as templates for many years afterward. One notable flaw on this map is the placement of the Mississippi river delta far to the west of where it should be. Hundreds of maps can also be viewed in our other digital collections. Browse 102 maps ranging from 1492-1850, compiled from 'American Journeys', a digital library and learning center of eyewitness accounts of early American exploration and settlement. Browse hundreds of maps ranging from 1917-present, compiled from more than 2,000 articles. View 39 online maps published in the 90 Wisconsin county history books. We have over 200 original bird's-eye-view maps of Wisconsin cities and villages dating from the 1860s to the early 1900s. See original maps from this Depression-era project that documented Wisconsin's land resources between 1929 and 1949. These maps identify local landowners within each Wisconsin county and provide information about cultural and topographical features. Digitally Reproduced Maps of Wisconsin and American History.Features hundreds of digitally reproduced maps from rare books, manuscripts, magazines and journals covering all aspects of Wisconsin and American History. Exquisite examples of significant maps related to New France and French Great Lakes exploration, early maps of Florida and Mexico, later maps of Wisconsin. 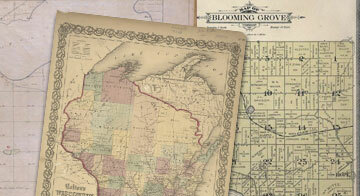 Access approximately 200 modern maps of basic cultural and geographical data about Wisconsin and its history. Perfect for teachers, students. Original, meticulously detailed street-level maps for 325 Wisconsin communities, 1883-1930, originally used to determine a property's fire hazard. Surveyors' Field Notes and Plat Maps .Hand-drawn township plat maps and surveyors field notes about tree cover, soils, streams, rock outcroppings, villages, trails and roads from 1833-1866.